Harphool Singh used to proudly tell everyone in his village about how his baby boy, Amit, was growing up to be smart and healthy- he’d already learned to identify names of household things and squeal ‘Mumma’ and ‘Pappa’ in his high-pitched voice. But unfortunately, Baby Amit started suffering from recurrent fever from a disease that couldn't be diagnosed for a long period. His condition kept worsening until he became totally unresponsive one day, whilst being treated at a local hospital in Madani, Rajasthan. His father, Harphool Singh rushed to get him to a better hospital in Jaipur, almost 115 km away and was able to get there in the nick of time. 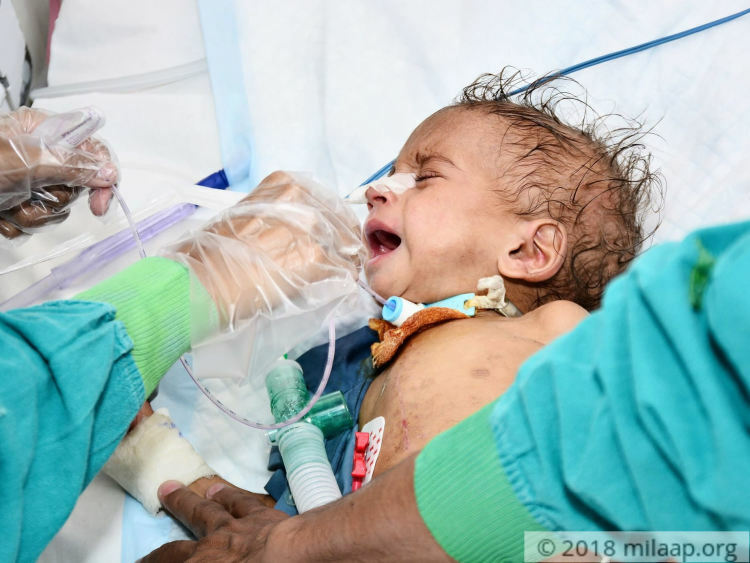 The doctors were able to save the little boy’s life, but he is still on ventilator support and cannot feed on his own. 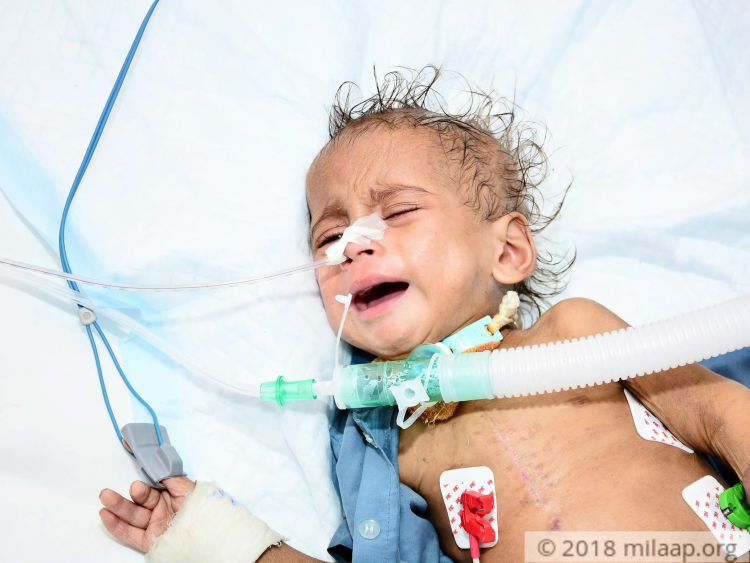 He needs intensive care for more than a week to survive now, but his father, a poor farmer, has completely run out of money and is struggling to save his only child. Harphool and Anita’s first child, Baby Amit, was born healthy and did not have any problems in the first few months of his life. However, this baby’s painful journey started around 2 months ago when he suddenly fell sick with a high fever. Harphool took him to many hospitals, but no medication could make him better. 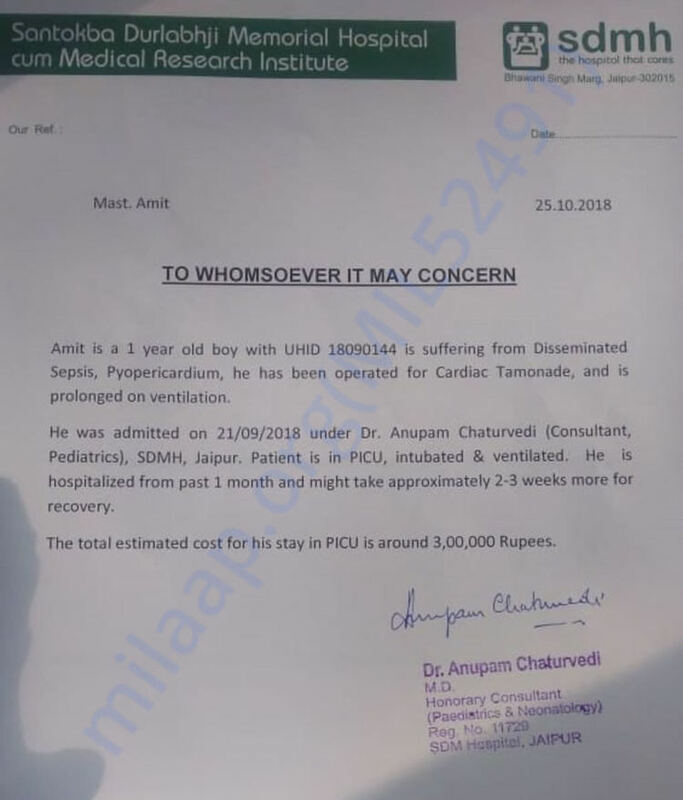 He spent more than a month in a local hospital in his hometown before being rushed to a multi-speciality hospital in Jaipur, where he had to be operated immediately on admission as he was suffering from pyopericardium with cardiac tamponade, a severe bacterial infection of the membrane encasing the heart cavity which causes compression of the heart. He was also suffering from a blood infection that was threatening to damage his vital organs. “If I had been even 1 minute late in getting my child to the hospital, I would have lost him. Thinking about how close he had been to death once makes me shudder. He has become so thin and malnourished, his old photos saved on my phone haunt me.”-Harphool Singh, father. 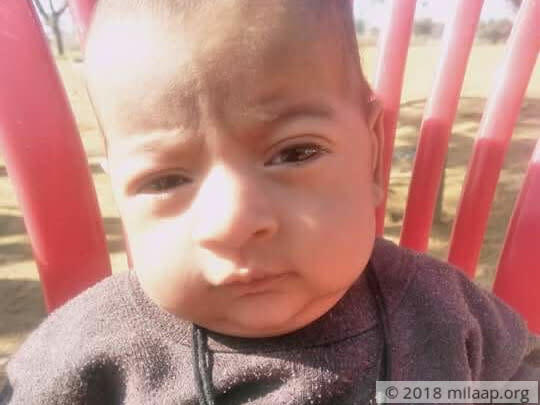 Baby Amit’s mother, Anita could not accompany him to Jaipur with her husband as she had to stay behind to take care of her paralysed mother-in-law and 6-month-old baby girl. 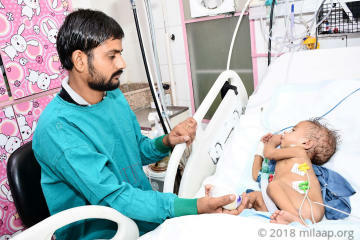 A farmer who earned less than Rs 10,000 a month, Harphool was forced to leave everything behind and go to Jaipur with his critical baby in his arms with little hope left. But his prayers were answered when the doctors said that Amit could survive with further hospitalization and care. Harphool breathed a sigh of relief but was soon faced with the fear of losing his son once again when all the money that he had borrowed from friends and relatives was exhausted. Now he finds himself completely alone – with no moral support nor financial support – in a city that is alien to him. He wants to save his son at any cost, but money is a big hurdle. “I tried saving as much money as I could by going hungry most of the time – how could I eat seeing my baby in that condition? But that is not enough. I hope and pray that I won’t have to stop his treatment – he will not survive in that case.”-Harphool. Baby Amit is still recovering from a surgery he had for a severe infection in the cavity surrounding his heart. He is still on ventilator support and antibiotics IV. He has not been able to eat solid food like before now, so he needs a few more days in the hospital to be completely alright. His poor farmer father is struggling all by himself to save his baby boy.